Gebr. van‘t Hek were recently contracted by Pleijsier Bouw as the subcontractor for foundation works for NH Hotel Group to work on Nhow RAI Hotel. 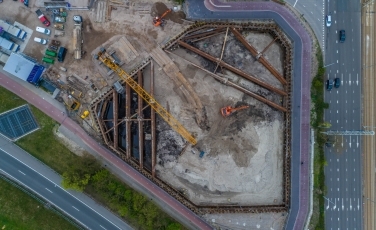 The project involves constructing the largest hotel of the Benelux (NH Hotel Group) at 91 metres high with 650 rooms and underground parking garage. The works being undertaken by Gebr. van‘t Hek include the pressing-in (vibration free) of a sheet pile construction including anchors and struts, the installation of HEK-combi-piles and the installation of anchor piles (type GEWI). The first use of octangular piles (under the name of octicon) as the prefabricated element as a part of the screwed displacement pile with a lost tip can be seen here. Due to the presence of the newly built underground metro (Noord- Zuidlijn), Gebr. van‘t Hek was required to press-in sheet piles diagonally. The project began in September 2016 and will be completed in 2019.